It is illegal in Utah to drive a boat while impaired or intoxicated by the use of illegal drugs, lawfully prescribed drugs or alcohol. Utah’s boating drunk driving laws are found within the usual automobile DUI statute of Utah Code Ann. 41-6a-502 and 503 (2018). The key is that Utah defines a “VEHICLE” for purposes of its automobile DUI laws to encompass motorboats. Here is how Utah’s DUI statute defines “VEHICLE” for purposes of Utah’s DUI laws. Utah Code Ann. 41-6a-501(j) (2018). (B) a motorboat as defined in Section 73-18-2. (11) “Motorboat” means any vessel propelled by machinery, whether or not the machinery is the principal source of propulsion. Being arrested for a boating DUI has all the same driver license sanctions that drunk driving carries. Hiring our Utah boating DUI attorneys at Howard Lewis & Petersen will put you in the best chance to defend false charges or inaccurate charges. Our DUI impaired boating attorneys offer a free consultation. UTAH BOATING DUI/DWI Driver License Sanctions. Just like regular car DUIs on I-15, all the same driver license sanctions apply. With a first time boating DUI charged as a Per Se violation, you will incur a 120 day driver license suspension. Your fine is $1,400, along with mandatory interlock if you own or drive a car. UTAH BOATING DUI/DWI CRIMINAL SANCTIONS. Utah has chosen to criminalize and prosecute boating DUI/DWI under it’s normal automobile DUI statute that is commonly used. Therefore the criminal penalties for a drunk or stoned boating are the same as the penalties/sanctions for a normal car DUI received. Field Sobriety Testing on Boats. Unique Aspects. Field Sobriety Testing was designed for alcohol and for land based activities, not while on a boat. 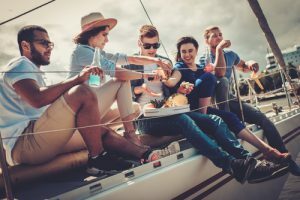 There are unique aspects of how you were arrested for the boating DUI that need to be investigated by a competent Utah DUI attorney. Another aspect is how you are detained while on the boat. Were you transported by boat to the dock? When were you formally under arrest? When charged with a Utah boating DUI, calling the experienced DUI attorneys at Howard Lewis & Petersen, PC will help. Open Contain Exception to Boating Passengers. Utah Code Ann. 41-6a-526 (2018). Utah law states that you cannot have an open container in a car, but there are exceptions for motorhomes, RVs, Limos and boats. Anderson Meadow Reservoir, Bear Lake, Blue Lake, Boulder Mountain Lakes, Causey Reservoir, Cleveland Reservoir, Cottonwood Reservoir, Currant Creek Reservoir, Cutler Reservoir, Deer Creek Reservoir, Duck Fork Reservoir, East Canyon Reservoir, Echo Reservoir, Electric Lake, Ferron Reservoir, , Fish Lake, Flaming Gorge Reservoir, Gooseberry Reservoir, Grantsville Reservoir, Gunlock Reservoir, Gunnison Reservoir, Gunnison Bend Reservoir, High Uinta Lakes, Holmes Creek Reservoir, Huntington Reservoir (State Park), Hyrum Reservoir, Jordanelle Reservoir, Kolob Reservoir, Koosharem Reservoir, Lake Powell, Little Dell Reservoir, Lost Creek Reservoir, Mantua Reservoir, Maple Lake, Mill Hollow Reservoir, Mill Meadow Reservoir, Miller Flat Reservoir, Millsite Reservoir, Minersville Reservoir, Newcastle Reservoir, Navajo Reservoir, Newton Reservoir, Nine Mile Reservoir, Otter Creek Reservoir, Palisade Reservoir, Panguitch Reservoir, Payson Lakes, Pelican Lake, Pineview Reservoir, Piute Reservoir, Quail Creek Reservoir, Red Fleet Reservoir, Red Lake Rockport Reservoir, Sand Hollow Reservoir, Sandwash & Bottle Hollow Reservoirs, Scofield Reservoir, Silver Lake, Smith & Morehouse Reservoir, Starvation Reservoir, Steinaker Reservoir, Strawberry Reservoir, Utah Lake, Valley Reservoir, Vernon Reservoir, Willard Bay Reservoir and Yuba Reservoir. FREE CONSULTATION FOR YOUR UTAH BOATING DUI. CALL (801) 373-6345.